This post is one of a series on a proposal for an Open Educational Resource vector graphics library, and builds on the post on customisation and localisation. Here is a discussion of how learners may create personal representations (avatars) that could appear in their open learning materials. The history of digital avatars is widely known. At the simplest level, users might choose between a handful of icons or other representations to express their identity. Or they might upload a picture to do the same thing. Or, in more complex cases (typical of some computer games or console frameworks) they might spend many minutes browsing through many sets of choices to create a highly individualised representation. Here, I will be exploring the possibility of using such avatars within learning material graphics, to literally put the learner in the picture. It may be useful to read my previous posts on OER graphics libraries for more background. First, it might be helpful to work through this simple customisation/personalisation demonstration. I will only cover the personalisation part here. Changing these should reflect in the front-back-right preview, and also in the first example ("interview") image. Note: if the page gives an error, it may have timed-out, in which case it can be reloaded. The code was still pretty crude as I write this post, and in production would have to be somewhat more advanced. In addition to reasons shared with previous posts, like increased user engagement, you may reflect on some reasons why avatars are successful elsewhere. Self-inclusion lets the learners make themselves the heroes (or at least protagonists) of their own learning stories. This might be particularly helpful for vocational courses, but may also have a slight positive effect on raising confidence and esteem. 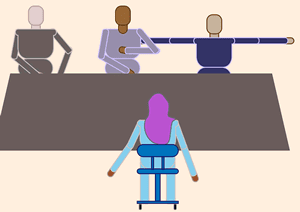 The interviewee is personalised using Sienna skin tone, HeadScarf head style with MediumOrchid colouring and SkyBlue clothing. Because the construction of the avatar is component-based, it can be posed, articulated and have parts swapped out for others (in my simple demo, all head styles are actually present at once, but all but the selected one are hidden by the styling). You may use your imagination as to what may be achieved using web graphic format SVG, or check out some examples like this Character Generator, which I believe is currently in the alpha development stage according to its designer. Because the use of avatars is well-known and popular, I will assume that there is potential for their use within learning material graphics: not to identify the learner to others, but to create a personal representation of their character that takes on the role of protagonist within the learning story they are presented with. Rather than simply accepting a representation depicted by others, this form of self-inclusion may be of some value in fostering positive identification with learning outcomes, especially in vocational, social skills and/or self-development learning. To the extent possible under law, Sleeping Dog has waived all copyright and related or neighboring rights to the text of That's me in the picture: personalisation of Open Learning Resources vector graphics. This work is published from: United Kingdom.